The cooling project are moving forward and I have received the items that I’ve ordered from eBay and also a got a perforated sheet of steel from a forum friend that I will use in my project. The plate will be used to provide better ventilation for the BPPC since it pushes out the head through the card from a fan that is installed on the top. Even with this it will still be a challange to get the BPPC cool. 1x 50x50x7mm heatsink with integrated 5V DC cooling fan. 2x 30x30x10mm 5V DC cooling fans (better airflow than original). 5x 40x40x10mm 12V DC cooling fans. Since I’m not 100% sure of what solution will be the best I will conduct a few tests to see what the best solution for me is. The first trial will be to increase the airflow through the Phase5 Blizzard PPC-card and work against the natural law of cooling. With that I mean to push alot of air through the top of the housing down through the card and out, forcing all new air to go through the upper ventilation. (I’m still VERY happy with my DOM (Disk On Module that you can see in the above picture). What have I chosen this solution? 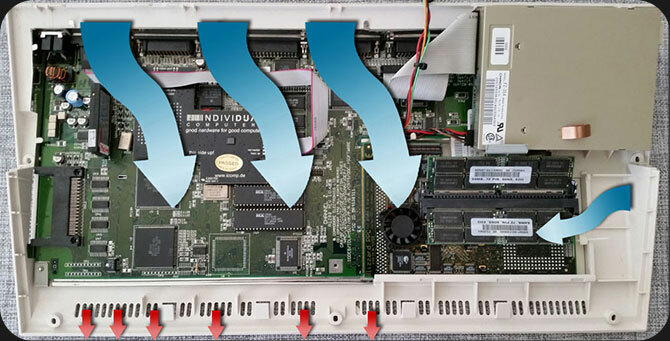 Because if I reverse the airflow, all the heatet air will go into the housing of my Amiga 1200 again and also the heated air from the MC68060 will also pass the 603e PPC. This will make my card go havoc in a few days or hours. Cut a hole in the trapdoor. The hole need to be as big as possible without causing the stability of the trapdoor. The perforated sheet of steel will be cut so it can fin in the newly made hole in the trapdoor. The fan in the BPPC card will be switched with the 30x30x10mm opne with higher amount of air flow. Some corners needs to be removed so the keyboard can fit. The 50x50x7 heatsick with integrated cooling fan will be mounted on the MC68060 CPU and it will be using the same power as the standard fan on the BPPC card. Mount a 40x40x6mm fan at the side of my Amiga 1200, close to the floppy drive to feed the housing with fresh air. A hole must of course be made in the housing.